Have you ever thought what might happen if there were a celestial event at the end of the year 2012 that could be hailed as a marker for truly apocalyptic events here on Earth? A Catholic priest working at the Vatican Observatory in Italy makes a chance discovery on Christmas Eve that will have global repercussions. As the story unfolds, humanity's reaction to this event acts as a trigger for outpourings of religious fervour, criminal behaviour and the threat of major global war. All the while a few individuals are swept along in a Tsunami of events that include kidnapping and terrorism, hysteria and heroism. A handful of scientists work to understand what has happened and why, doing their best to reassure and to re-evaluate an event of truly Earth-shattering significance against a backdrop of human prejudice and frailty. This amazing and fast paced story whisks you from Rome to Edinburgh, London, Chicago, New York, Washington and to Tel Aviv and beyond. Ninian's writing has been likened to that of Michael Crichton, Dan Brown and Carl Sagan. If you like a book that keeps you turning the pages to find out what happens next and is high in plausibility, then 'In The Lion's Paw' is a 'must read' of 2011, 2012 and for many years to come. In the Lion's Paw, is the first novel by Ninian G Boyle. He is an experienced published writer in his field of astronomy, having written features and articles for magazines such as the BBC Sky at Night Magazine and 'Astronomy Now' Magazine and other periodicals on the subject. 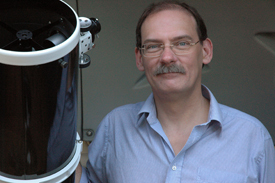 He is a Fellow of the Royal Astronomical Society and a member of the British Astronomical Association and has made appearances on the BBC Sky at Night Television Programme with Sir Patrick Moore as well as on local BBC Radio. Ninian even had his own TV programme on the Sky Information Channel called 'Stargazer'. He lectures and teaches in astronomy to local societies and other organisations and gives talks and holds night classes at his local Planetariums. He also runs 'Astronomy Know How' a small business dedicated helping amateur astronomer at all levels. He likes nothing more than assisting people get started in what he describes as 'the most amazing hobby'. He was raised a Roman Catholic but professes to 'no religion', but feels his background gave him an insight into the workings of the Catholic Church, which proves very useful for the plot of the book! Ninian has been aware of the ideas about the 'End of the World' philosophies if that is what you could call them, connected with the end of the Mayan Calendar in December 2012, for some time. The huge amount of mis-information about this subject, whether unintentional or not, was a 'prime motivator for the writing of the book', he says. He also like to play with 'what if' ideas. This is made abundantly clear in 'In The Lion's Paw'. He enjoys writing, teaching and using his telescope, as well as music, both listening and playing as he is also an accomplished musician. He lives with his wife and two sons in southern England.